LAS VEGAS – OCT. 30, 2017 – East Coast Defender (E.C.D.) has teamed up with Warn Industries to debut their hand-crafted, custom Land Rover Defenders at this year’s SEMA Show, which will be held Oct. 31 – Nov. 3, 2017, in the Las Vegas Convention Center. E.C.D. will display “Project Beast” in the Warn Industries booth (#31059) located in the Upper South Hall. 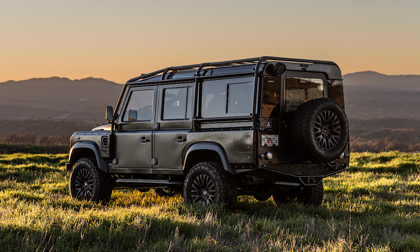 The hand-crafted, custom re-built Land Rover Defender 110 features a 430 horsepower Chevrolet LS3 engine with custom features and appointments throughout. Project Beast is an elite off-road SUV, hand-built by East Coast Defender at the company’s headquarters and manufacturing facility, the Rover Dome in Kissimmee, Fla. It features a Kahn wide-body kit that has been seamlessly integrated into the Defender to reach a new level of aesthetic brilliance. Under the hood is a powerful and agile LS3 engine that delivers incredible performance. The hand-built SUV, which was completed in 2016, started life as a 1985 Land Rover Defender and features custom appointments throughout, including a Warn winch. To see “Project Beast” and talk with an East Coast Defender representative about their custom, hand-crafted Defenders and Range Rover Classics, visit the Warn Industries booth (#31059) located in the Upper South Hall.